A study finds overdiagnosis with increased screening, but there’s no way to determine which tumors do not need to be treated. As radiologists, oncologists, patients, and advocates continue to wrestle with when mammography screening should begin, a new study suggests that with more views of breast tissue comes more potential overdiagnosis of breast cancer. The study, published in the Annals of Internal Medicine, concludes that mammography screening entails a substantial amount of overdiagnosis, which could lead women to undergo unnecessary and potentially harmful treatments. Some believe the research casts more doubt on screening mammography, a modality still dealing with an identity crisis in the wake of the US Preventive Services Task Force’s 2009 recommendations suggesting that women at normal risk of breast cancer can reasonably delay mammography screening until they reach the age of 50. However many people in the breast imaging field still recommend mammograms for women at normal risk begin at age 40. The split creates a decision for referring physicians and patients regarding when to start breast cancer screening. Many breast radiologists contend that the idea of overdiagnosis and potentially unnecessary treatment of nonfatal cancer adds to the dilemma for doctors. In blunter words, if you can’t differentiate between the tumors that will progress and kill a woman and the ones that will never harm her, how do you decide which tumors to treat? Breast radiologists assert that it’s too early to discuss what to do when mammography uncovers a tumor that fulfills the laboratory criteria of cancer but, if left alone, would never cause the patient any harm. They contend that, since science cannot accurately predict which tumors are harmless and which are more aggressive, it’s necessary to treat any tumor that's found as if it's deadly. That means surgical removal and sometimes radiation or chemotherapy. The objective of the report, “Overdiagnosis of Invasive Breast Cancer Due to Mammography Screening: Results From the Norwegian Screening Program,” was to estimate the percentage of overdiagnosis of breast cancer attributable to mammography screening. This was done with a comparison of invasive breast cancer incidence with and without screening. Tamimi says the data from Norway provided a unique opportunity to review data collected during the county-by-county introduction of a breast cancer screening program for women aged 50 to 69 that took place from 1996 to 2005. Researchers analyzed approximately 40,000 breast cancers, comparing cases found in counties where screenings were offered against counties where screenings were not yet offered. The study’s authors found that instances of invasive breast cancer increased 18% to 25% among participants who received screening mammography. They also found that between 1,169 and 1,948 of those women were overdiagnosed and received unnecessary treatments. 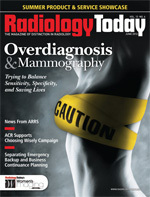 Carol H. Lee, MD, FACR, attending radiologist at Memorial Sloan-Kettering Cancer Center in New York and chair of the ACR’s Breast Imaging Commission Communications Committee, notes that the Norwegian study findings agree with those of the US Preventive Services Task Force recommendations, which suggested that there is a risk of overdiagnosis based on the number of women screened. However, she’s not suggesting that this means cancers found in breast tissue should be left alone. Lee contends that screening mammography shouldn’t decrease just because it may find cancers that are not deadly. “Does it make sense to stop finding cancers because some of them will not go on to be fatal?” she asks. Lee also challenges the use of the term “overdiagnosis,” saying instead that nonlethal breast cancer may be overtreated, not overdiagnosed. Looking at the study’s parameters, radiologist Stamatia Destounis, MD, managing partner of Elizabeth Wende Breast Care in Rochester, New York, questions the validity of the data, noting that “if you want to prove something invalid you can look at the data any way you want.” In particular, she points to the time span used to gather data for this study. In her work with the ACR, Lee spends a great deal of time discussing the benefits of breast cancer screening. With the publicity that surrounds studies like this and the task force recommendations, she says referring physicians and women are unsure of what steps they should take when it comes to mammography. One of Lee’s arguments against studies like this and the task force recommendations is that with an epidemiological study you’re dealing with mathematical modeling rather than with actual practice. Shermis agrees that epidemiology has its place when studying breast cancer from a public health perspective. However, while the studies may provide insight to cost factors associated with unnecessary medical procedures and the stress associated with screening mammography follow-ups, they don’t address the human aspect of detecting the disease in women. Shermis and others believe these study results simply add to the already confusing amount of information disseminated in the past several years regarding screening mammography guidelines. Identifying cancer is not a perfect science, Shermis notes. However, it is the job of breast imagers, oncologists, and surgeons to follow the proper steps required to make the best educated decision possible when it comes to breast cancer detection and ultimately a course of treatment. Rather than a continued focus on the ethicality of breast cancer screening, Lee suggests that researchers look to finding a way to sort out which cancers have the potential to be lethal and which are safe to leave alone. Tamimi believes that’s where data from the Norwegian study can actually be used to help the evolution of breast screening guidelines. Pointing out instances of overdiagnosis and overtreatment of tumors found in the breast can help researchers determine where to focus next in the process of developing accurate breast cancer detection methods. Advancements in imaging technology and the use of ultrasound and MRI in scanning breast tissue continue to help locate tumors but, in many cases, also increase the incidence of false-positives. But there are other areas where further research could help identify what the technology is finding. “They need to look at tumor characteristics and tumor markers and learn more about which traits are less aggressive,” Tamimi says. Tamimi says the Norwegian study serves as a starting point for more effective communication between physicians and patients regarding overdiagnosis, which she contends goes hand in hand with misdiagnosis. Lee points out that while this study brings up the issue of too much screening and the potential for overdiagnosis that might come with that, at the same time state and federal governments are debating the legislation of mandatory breast density notification. Texas, Connecticut, and Virginia passed laws within the last two years that require radiologists to notify patients if they have dense breast tissue following routine screening mammography; other states, as well as the federal government, are considering similar measures this year. There is the belief that legislating dense breast notification could lead to more screening with ultrasound, MRI, and other imaging modalities, which could lead to more false-positives. While Lee recognizes that mammography is not perfect, it is the only screening tool that has been shown to decrease mortality from breast cancer. “The bottom line is that screening mammography saves lives,” she says.